Palladium, 18k yellow gold, diamonds, yellow sapphires. 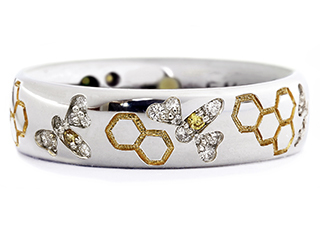 Inspired by another of Neruda's poems, this ring symbolizes love. Honey Bees have long been associated with love. Cupid, the god of love, is said to have dipped the tips of his arrows in honey before firing them. The bee’s sting has been likened to that of the arrows of Cupid - with the sweetness of love there is always the danger of love's sting.